The view remains the same as before. 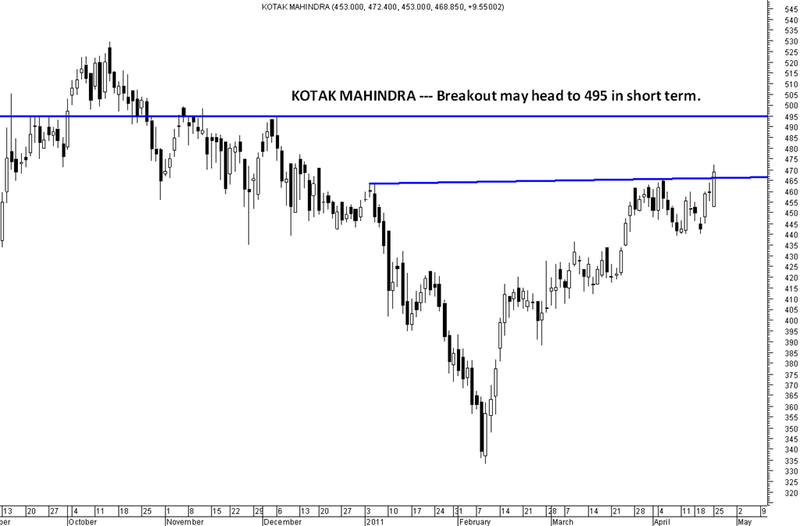 Watch for a clean move above 5950 for a breakout trade to 6050-6100. 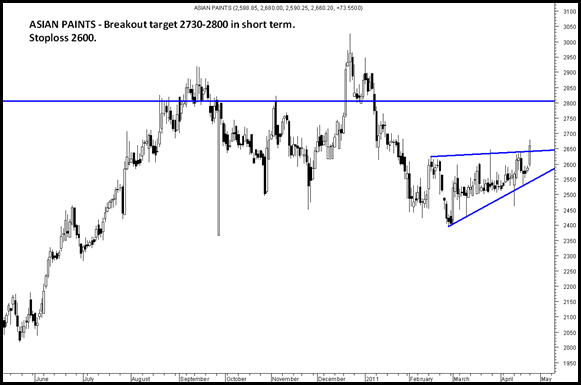 Stock seems to have given a breakout and headed to 2730-2800. 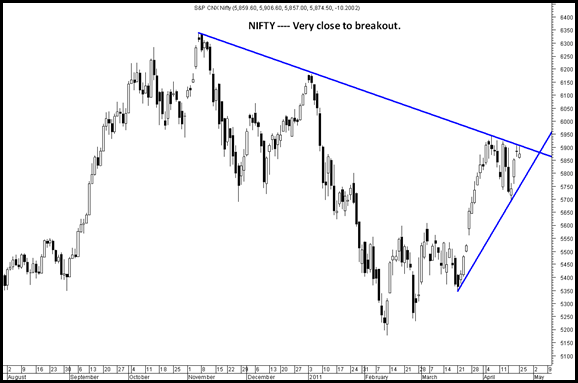 Disclosure: Recommended at 2650 to clients. 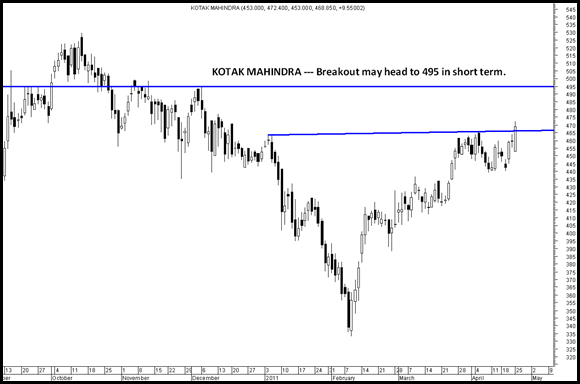 KOTAK MAHINDRA – A small breakout may give a quick move to 495. Stoploss 462. 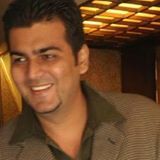 Of late the flow of information has become very fast due to various modes of communication:). So i thought would add some market buzz as received by me 🙂 from unconfirmed sources and rumours. Gati may soon announce a stake sale in coming few days. Camlin also some stake sale or something on cards. Chemplast Sanmar is an interesting bet according to smart circles and some turnaround. Our yesterdays recommendation TRF did a 20% circuit 🙂 cheers. Tea Stocks may again show momentum – Mcleod Russel can do 300 in short term. Interest seems to be back in MNCs with possibility of delisting. But investors should be careful in choosing their bets and not expect major returns. Foseco, Wyeth Ltd, Pfizer, Elantas,BOC India, Novartis which look attractive on declines. 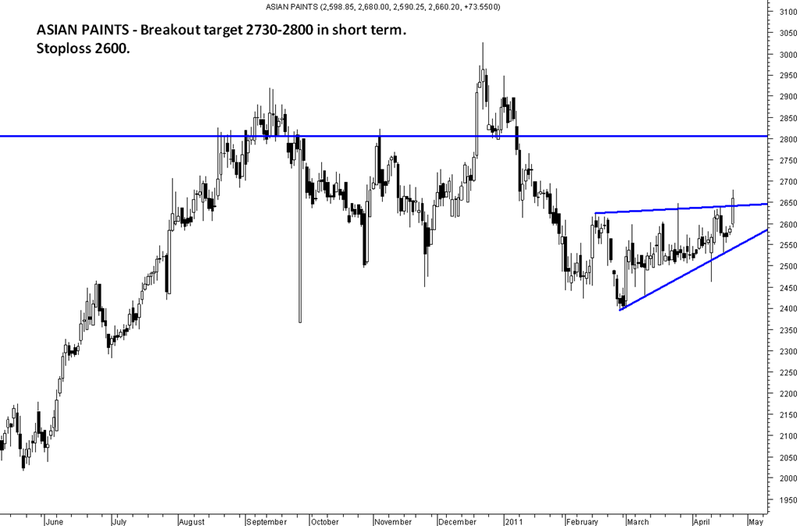 Alok Inds continues to look good to buy for short term. Also textiles as a sector is interesting fundamentally as per smart investors. NESCO is an interesting value play. Warrants a deeper study with increasing volumes. RIL! HDFC! INFY! What returns can be expected in 1 Year ? Reliance Inds a good buy arnd 950-980 provided you have patience.